Mr. Shrinkwrap's Heat Gun Repair Service will restore the performance of your heat gun tool quickly, and at a reasonable price! Mr. ShrinkWrap offers heat gun repair services for all Shrinkfast (998, 975) and Ripack (2000, 2200, 3000) heat gun models. 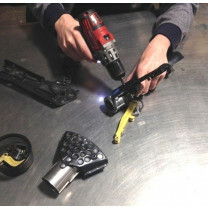 Customer is responsible for shipping heat gun and all associated parts to be tested (hose and regulator). We require all parts associated with operating the heat gun be sent to us to ensure that when your heat gun is returned, it is fully operational and ready to go. Any additional parts that need to be replaced will be billed in a separate transaction. No shipping will be charged for the parts since return shipping is included in repair fee. If Repair requires longer than 1 hour, customer will be billed at $80.00/hour in 15 minute increments. Customer will always be contacted with estimated total cost before any repairs are made. If customer does not agree to charges, customer will be refunded repair fee minus $20.00 for return shipping and handling. If you have any questions, please don't hesitate to give us a call at 800-847-5290.